Beginning with the 2014 model year, Infiniti will apply a new naming structure with the model range simply prefixed either by Q – for sedans and coupe, or QX – for crossover and SUV models. The strategic change reflects our desire for clarity and cohesiveness as we embark on ambitious growth plans to expand the Infiniti portfolio. The ‘Q’ is found to capture the inspiration within the next generation of Infiniti models while emphasizing our performance credentials. It also harks back to our heritage with the Q45 – Infiniti’s first flagship model in 1989. Q: WHY IS INFINITI CHANGING ITS VEHICLE NAMING STRUCTURE? A: Our nomenclature change is the result of extensive research with customers, retailers and business partners. Not only will the change make our line-up clearer and easy to understand, it will also give us greater flexibility when it comes time to expand our range of vehicle models. 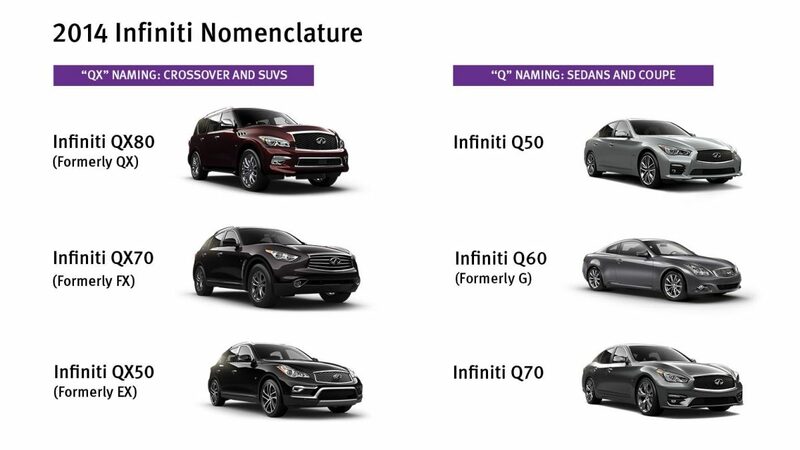 Q: WHAT’S BEHIND THE CHANGE TO INFINITI’S NAMING STRUCTURE? A: We specifically chose the letter 'Q' to pay tribute to the Q45 – the very first Infiniti ever to be launched in 1989. The Q45 embodies the Infiniti values of precision, passion, provocation, and performance. Not only was it our flagship vehicle, it was the car that helped redefines what a modern luxury sedan should be. Q: WHAT WILL THE NEW NAMING STRUCTURE BE? A: Beginning with our 2014 models, Infiniti cars will be prefixed by Q, for sedans, coupes and convertibles, and QX, for crossover and SUV models. Each model will be identified with a 'Q' or 'QX', plus a double digit to represent pricing hierarchy within the range. Q: WHAT DO THE TWO DIGITS REPRESENT, AND WHERE WILL THEY APPEAR IN THE VEHICLE? A: The double digits attached after the 'Q' or 'QX' identify individual models in order of pricing structure. The badges will appear on the right-hand side of the boot lid of each vehicle. Q: WHAT WILL THE NEW BADGES AND SUFFIXES INCLUDE? A: Badging will appear on the right-hand side of the boot lid of each model after the model alphanumeric. Technology components such as powertrain identification (including hybrid and engine displacement) will be badged on the front fenders of each model (e.g. 'HYBRID' or '3.7'). Q: HOW WILL ENGINE SIZE BE REFERRED TO? A: Engines will be referred to simply and directly. 2.5 for a V6 2.5-litre powered model 3.7 for a V6 3.7-litre powered model, and 'HYBRID' for a V6 3.5-litre hybrid-powered model. Q: WILL MY PRE-Q INFINITI MODEL DE-VALUE? A: According to all residual value assessors, the new naming strategy will bring us a more structured range and will have a positive effect on our residual values. Because a reinforced residual value is very important for Infiniti, we are also putting a battery of measures in place, including trade-in facilities in selected markets. As such, we forecast a residual value improvement in all our products. Q: IF THERE’S A CROSSOVER PERIOD AT MY DEALERSHIP, FOR EXAMPLE WITH THE FX & QX70, WILL THE FORMER BE PRICED MORE COMPETITIVELY? A: We’ll base this on the usual principles that apply to old and new models. Contact your local Infiniti Centre to discuss your requirements. Q: SINCE THE NAME OF MY CAR CHANGED, WILL YOU BE SENDING ME NEW BADGES WITH THE NEW NAME? A: Q is not a re-brand. We’ll be introducing the structure with each new model so we won’t be retrospectively rebranding any of the older models. Q: IF I JUST SAY I DRIVE A Q, IT COULD MEAN ANYTHING, AND THE NUMBERS COULD ALSO MEAN A SEDAN OR A CROSSOVER. WHAT DO I TELL PEOPLE? A: The accurate model name will consist of Q/QX followed by double-digit numbers. For example, you would say you drive a Q60. Q: I PURCHASED A FX, WHICH I THOUGHT WAS AN ALL-NEW MODEL FOR INFINITI. WHY ARE YOU CHANGING THE NAME SO SOON AFTER INTRODUCING IT? A: It is always difficult to find the right time for change – but we felt that the new model year 2014 was a natural time to launch what is, for us, a new beginning. Q: MY CURRENT CAR IS AN FX37. UNDER THE NEW NOMENCLATURE, WILL IT BE QX70 3.7 AWD? A: It will simply be called QX70. Indication of 3.7 engine size will be badged on the front fenders. Q: MY FRIEND HAS A 3 SERIES; ANOTHER HAS A C-CLASS. WHAT’S THE ‘SHORTHAND’ FOR Q50? IS THERE ONE? A: We will have one name for all grade models in the same model range, which is Q/QX followed by double digit numbers. Q50 will be the name that is equivalent to 3 Series or C-Class.